Decoration 4 incipit pages with ornamental initials in gold and colours and display script in gold, framed by 'Winchester style' borders in colours and gold, with foliage intertwined with gold bars and medallions with figures, at the beginning of the Gospels (ff. 6, 45, 70, 111). Initials in gold throughout the text. Binding BM/BL in-house, over old wooden boards. Provenance Written in Christ Church, Canterbury, by the scribe of Trinity College B. 10. 4 (215), Rouen BM Y. 6 (274) and Copenhagen, Royal Library, G.K.S. 10, 2°, all associated with Christ Church (see Bishop, 1967). A note, in Anglo-Saxon, of the admission of Cnut (d. 1035), king of England, of Denmark, and of Norway, and his brother Harold into the confraternity [of Christ Church, Canterbury? ], certified by the names of brothers Ðorð, Kartoca, and Thuri ( f. 43v); a charter of Cnut, in Anglo-Saxon (probably c. 1017, when Cnut became king of all England), addressed to Archbishop Lyfing (1013-1020), Godwin, bishop [of Rochester, dates uncertain], Ælmær, abbot [of S. Augustine's, Canterbury? 1006-1022), and others, confirming the privileges of the church, written by Eadwig [Eadui] Basan (fl. 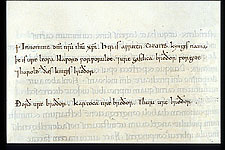 c.1020), (see Gameson 2004) (f. 44v). John Lumley, 1st baron Lumley (b. c. 1533, d. 1609), collector and conspirator: inscribed with his name (f. 6); listed in the 1609 catalogue of his collection, no. 302 (see The Lumley Library, 1956); his library acquired by Henry, prince of Wales. Includes the Epistle of Jerome to Damasus (ff. 1-2v), an extract from Jerome's commentary to Matthew, 'Plures fuisse' (ff. 2v-3v), the Epistle of Eusebius to Carpianus (ff. 3v-4v), a preface 'Sciendum etiam' (ff. 4v-5), and a table of lections from the Gospels in a different hand (ff. 139-150v). Originally bound in wooden boards, one of which was hollowed out ('huius etiam libri operculum antiquum est altera parte excavatum: vide i A. xviii'), according to David Casley (A catalogue of the Manuscripts of the King's Library (London: 1735), see also Warner and Gilson 1921, p. 17). Includes the full set of Franco-Saxon prologues and prefaces to individual books: see discussion Richards 1988. Select bibliography Frederick Henry Ambrose Scrivener, A Plain Introduction to the Criticism of the New Testament, 4th edn, ed. by Edward Miller, 2 vols (London: George Bell & Sons, 1894), II, 75. F. C. Kenyon, Facsimiles of Biblical Manuscripts in the British Museum (London: British Museum, 1900), no. 17. [George Warner], Reproductions from Illuminated Manuscripts, Series I, 3 vols. (London: British Museum, 1907-08), pl. 6. Schools of Illumination: Reproductions from Manuscripts in the British Museum, 6 vols (London: British Museum, 1914-1930), I: Hiberno-Saxon and Early English Schools A. D. 700-1100, pl. 15. George F. Warner and Julius P. Gilson, Catalogue of Western Manuscripts in the Old Royal and King’s Collections, 4 vols (London: British Museum, 1921), I, p. 17. [J. A. Herbert], British Museum: Reproductions from Illuminated Manuscripts, Series 1, 3rd edn (London: British Museum, 1923), pl. VI. Henry Jenner, 'The Bodmin Gospels', Journal of the Royal Institution of Cornwall (1923) 113-45 (pp. 139, 145). R. Priebsch, The Heliand Manuscript: Cotton Caligula A VII in the British Museum (Oxford: Clarendon Press, 1925), p. 49. Eric. G. Millar, English Illuminated Manuscripts from the Xth to the XIIIth Century (Paris: Van Oest, 1926), I, no. 24 pl. 18. R. Priebsch, The Heliand Manuscript Caligula A. VII in the British Museum: A Study (Oxford: Clarendon Press, 1925), p. 49. H. H. Glunz, History of the Vulgate in England from Alcuin to Roger Bacon (Cambridge: Cambridge University Press, 1933), no. 37. Guide to an Exhibition of English Art gathered from Various Departments and held in the Prints and Drawings Gallery (London: British Museum, 1934), no. 80. Theodor Klauser, Das römische capitulare evangeliorum: Texte und Untersuchungen zu seiner ältesten Geschichte, Liturgiegeschichtliche Quellen und Forschungen. 28 (Munster: Aschendorffschen, 1935), p. LI. G. L. Micheli, L’enluminure du haut moyen âge et les influences irlandaises (Brussels: Editions de la connaissance, 1939), p. 159 n. 4. Francis Wormald, ‘Decorated Initials in English MSS. from A.D. 900 to 1100’, Archaeologia, 91 (1945), 107-35 (p. 132). D. Talbot Rice, English Art 871-1100, Oxford History of English Art, 2 (Oxford: The Clarendon Press, 1952), pp. 195-96, pl. 58. T. A. M. Bishop, 'Notes on Cambridge Manuscripts', Transactions of the Cambridge Bibliographical Society, 2 (1955) 185-99 (p. 186). The Lumley Library: The Catalogue of 1609, ed. by Sears Jayne and Francis R. Johnson (London: British Museum, 1956], p. 65. N. R. Ker, Catalogue of Manuscripts containing Anglo-Saxon (Oxford: Clarendon Press, 1957), no. 247. Godfrey Rupert Carless Davis, Medieval Cartularies of Great Britain: A short catalogue (London: Longmans, Green,1958), p. 22. Medieval Libraries of Great Britain: A List of Surviving Books, ed. by N. R. Ker, 2nd edn, Royal Historical Society Guides and Handbooks, 3 (London: Royal Historical Society, 1964), pp. 36, 361. Margaret Rickert, Painting in Britain: the Middle Ages, 2nd edn (London: Penguin Books, 1965), pp. 38-39, 49, 224 n. 65, pl. 28b. T. A. M. Bishop, 'The Copenhagen Gospel', Nordisk Tidskrift för Bok- och Biblioteksväsen, 54 (1967), 33-41 (pp. 39, 41, fig. 2). Jonathan J. G. Alexander, Norman Illumination at Mont St Michel 966-11000 (Oxford: Clarendon Press, 1970), p. 60 n. 4. T. A. M. Bishop, English Caroline Minuscule (Oxford: Clarendon Press, 1971), p. XV, nos. 23, 24. English Illuminated Manuscripts 700-1500, ed. by J. J. G. Alexander and C. M. Kauffmann (Bruxelles: Bibliotheque Royale Albert, 1973), p. 30. [Exhibition catalogue]. Elzbieta Temple, Anglo-Saxon Manuscripts 900-1066, Survey of Manuscripts Illuminated in the British Isles, 2 (London: Harvey Miller, 1976), no. 70. Mary Richards, Texts and Their Traditions in the Medieval Library of Rochester Cathedral Priory, Transactions of the American Philosophical Society, 78, part 3 (Philadelphia: The American Philosophical Society, 1988), p. 66. T. A. Heslop, 'The Production of De Luxe Manuscripts and the Patronage of King Cnut and Queen Emma', in Anglo-Saxon England, 19, ed. by Michael Lapidge and others (Cambridge: Cambridge University Press, 1990), pp. 151-98 (pp. 154, 59 n. 49). David N. Dumville, English Caroline Script and Monastic History, Studies in Benedictinism, A.D.950-1030 , Studies in Anglo-Saxon History, 6 (Suffolk: Boydell, 1993), pp. 86, 113, 116-20, 122, 139-40. Patrick McGurk and Jane Rosenthal, 'The Anglo Saxon Gospel Books of Judith Countess of Flanders: Their Text, Make up and Function', Anglo-Saxon England, 24 (1995) 251-308 (pp. 258-62). Helmut Gneuss, ‘Origin and Provenance of Anglo-Saxon Manuscripts: The Case of Cotton Tiberius A. III’, in Of the Making of Books: Medieval Manuscripts, their Scribes and Readers: Essays presented to M. B. Parkes, ed. by P. R. Robinson and Rivkah Zim (Aldershot: Scholar Press, 1997), 13-48 (p. 48). Richard Marsden, 'Ask What I am Called': The Anglo-Saxons and Their Bibles', in The Bible as Book: The Manuscript Tradition, ed. by John L. Sharpe III and Kimberly Van Kampen (London: British Library, 1998), pp. 145-76 (p.175). Helmut Gneuss, Handlist of Anglo-Saxon Manuscripts: A List of Manuscripts and Manuscript Fragments Written or Owned in England up to 1100, Medieval and Renaissance Texts and Studies, 241 (Tempe: Arizona Center for Medieval and Renaissance Studies, 2001), no. 447. Diane Reilly, ‘French Romanesque Giant Bibles’, Scriptorium: Revue internationale des études relative aux manuscrits, 56 (2002), 294-311 (p. 294 n. 1). Richard Gameson, ‘Eadwig Basan (fl. c.1020)’, in Oxford Dictionary of National Biography (Oxford: University Press, 2004) [http://www.oxforddnb.com/view/article/55374] [accessed 13 Oct 2011]. The Cambridge Illuminations: Ten Centuries of Book Production in the Medieval West, ed. by Paul Binski and Stella Panayotova (London: Harvey Miller, 2005), pp. 59, 62. Richard W. Pfaff, The Liturgy in Medieval England: A History (Cambridge: University Press, 2009), p. 90 n. 80. Royal Manuscripts: The Genius of Illumination (London: British Library, 2011), no. 7.